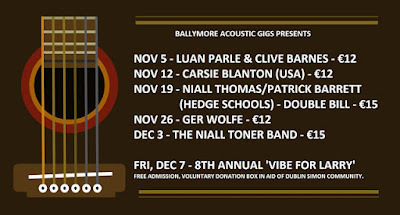 Ballymore Acoustic Gigs (BAG), based at Mick Murphy's, Ballymore Eustace, Co. Kildare, announce the programme of six gigs in November and December 2018. All except the last are on a Monday, starting at 9.00 p.m. sharp, with doors open at 8.30 p.m. Admission is as shown on the image above. There is free admission to the 8th annual 'Vibe for Larry', held in honour of the late Larry Roddy on Friday 7 December to end the 2018 season. 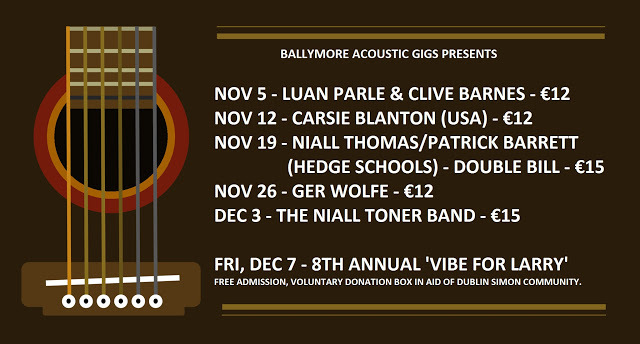 For BIB readers the main event will be the show by the Niall Toner Band on Monday 3 December. Links to artists' websites are on the BAG blog.